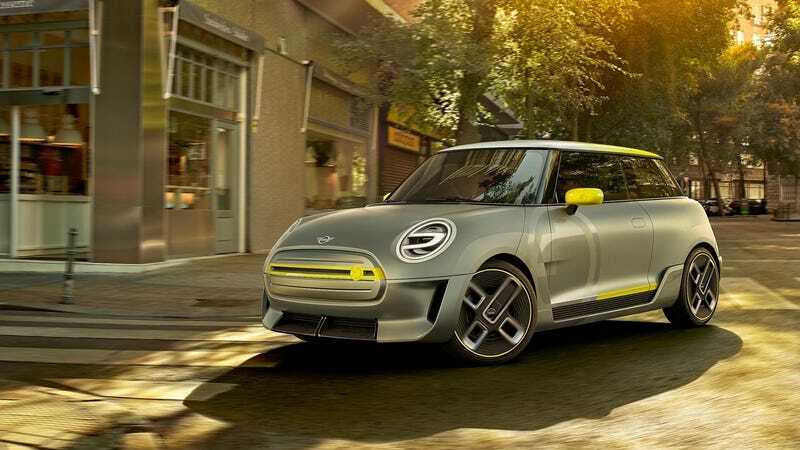 Mini is getting into the electric game again after a soft approach back in 2008, and while this new Mini Electric Concept is the result of many questionable decisions, Mini going electric just makes too much sense to avoid. As you can see, the 2017 Mini Electric Concept is just a gutted hardtop Mini coupe that runs on the magic of electricity, set for production in the far-flung futures of 2019. There’s quite a bit of styled flair, stealing the yellow cues from the original Mini E from nearly a decade ago, as well as some other stuff down the side of the car that Car And Driver promises isn’t going to make it to production, thankfully. I’m not a fan of the ‘Reflection Silver’ paint work, nor do I like the weird faded white-yellow roof panel. The sides are busy, the wheels are silly, but the front and rear treatments are actually pretty subtle for an electric car, and the cool new headlights, Union Jack taillights and thin stripe on the grille treatment are a simple but effective sign that this ain’t a normal Mini. It’s odd that Mini went for the two-door hardtop to re-introduce an EV model, though. If the goal is to eventually shift the brand to a future lineup of all EVs or hybrids, and to make an attractive electric model that could appeal to a larger crowd of consumers, why wouldn’t Mini go for something more practical, like the Countryman, Clubman, or even the 4-door hardtop they just introduced? Why must EVs seemingly always have to be compromised by being tiny two-door cars just slightly too small for people like my parents to take interest in still? Anyway, the two-door is what we’re getting, at least at first, and it’s based on the BMW i3's electric heart, which pretty much only guarantees under 200 miles of range (though Mini may manage to get there, it’s not clear) and maybe around 150 horsepower. That’s less than the previous electric Mini. Oh well. Melding the typical compact, city-going approach to the electric car with Mini, a brand that only makes ‘compact’ vehicles anyway, makes a lot of sense. Mini is practically perfect for EV applications. I’m going to miss the forced exhaust pops from the JCW I drove last year, though. I may have looked stupid, but I was having fun.